Speaking of Arab nations now working with the IPA’s programs, Kolman made a point of underscoring the organization’s determination to stand for dialogue and cultural outreach in the face of current political movements toward nationalism. 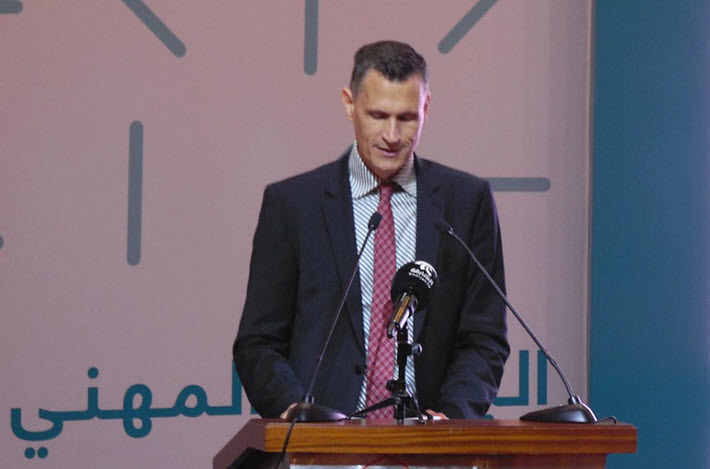 In the last two years, he said, the publishers’ associations of Saudi Arabia, Jordan, and Tunisia have become full members of IPA, joining their Egyptian, Lebanese, and Emirati counterparts. “The IPA embraces dialogue and inclusivity to the benefit of all of its members,” Kolman said. 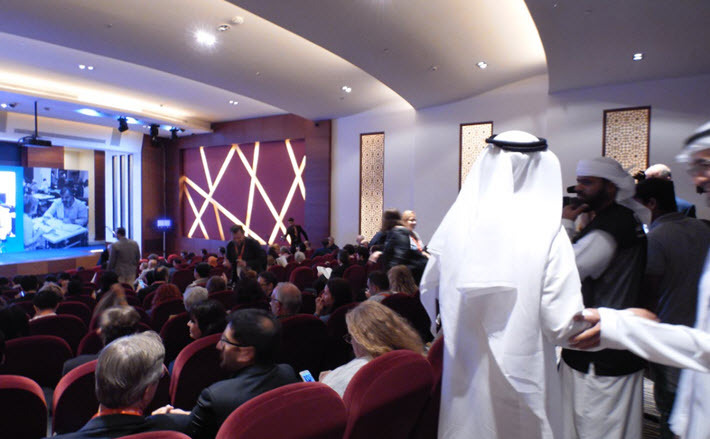 In an interesting reference to “big data,” Kolman also told the audience at Sharjah’s Chamber of Commerce, “Many publishers these days recruit as many coders and analytics geeks as arts graduates.” Kolman isn’t without insight in this regard, being a senior vice president for information industry relations with Elsevier in Amsterdam. The professional program at Sharjah this week again includes three mornings of presentations, staged conversations and panels followed by afternoons of rights trading, ahead of Wednesday’s opening of the fair, itself, which runs November 1 through 11. Monday evening, the long-awaited Sharjah Publishing City opens as the world’s first free trade zone for publishing, as described in Publishing Perspectives‘ interview with Sharjah Book Authority chairman Ahmed Al Ameri. Sharjah’s ruler, the Sheikh Sultan bin Mohammed Al Qasimi, and his publisher-daughter the Sheikha Bodour bint Sultan Al Qasimi are tireless creators and patrons of initiatives that place books and reading at the center of Sharjah culture, one reason that UNESCO has named Sharjah its World Book Capital 2019. 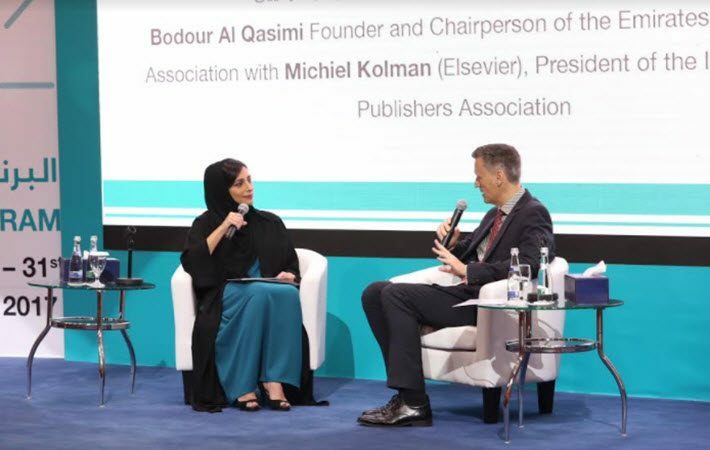 Following Kolman’s speech, Sheikha Bodour engaged in an onstage “fireside conversation” with Kolman, who, in response to Bodour’s question about publishing formats, said that he’s comfortable with the three-part format seen developing in many markets today. In his estimation, the mature markets are seeing ebook growth on “a good plateau,” the print format on a robust footing, and the audiobook part of the market still surging. And Bodour’s most cogent question was about innovation but went beyond the normal question of what to look for in innovation or how to accomplish it: she asked Koman how important it is.